One nice thing about Boston is that my bank has an ATM on every corner, and there's no 1% foreign currency charge. Another is that Bostonites have the highest per capita rate of donning sports team attire on days when there's not a game than any city I've ever visited. Compared to when I lived in town, the Somerville/Cambridge/Boston area is crawling with bicycles. The cyclists, most of whom do not look like serious athletes, usually wear padded spandex bike shorts. And helmets. Where are my Parisian bikers in their peacoats and stilettos, with hair flowing in the breeze? Are these Bostonites all training for a race that I don't know about? Today I'm heading to the beach in Maine to camp with some old college friends. It should be like my night in Versailles, round two, except that this time there'll be friends and tents and fires and hot dogs and beer. It's good to be back. Yep, tomorrow I fly to Boston. I'll stay a week, then return to Chicago on MAY 26!!! It'll be my first time in the States since September. Besides cake doughnuts, I'm really looking forward to American showers, take-out Thai, twelve-ounce coffee to go...ummmm...the US dollar, used bookstores with English books, not looking slovenly compared to the Parisians, a full wardrobe of clothes and shoes, $4 burritos, Chicago pizza, root beer, oh, and not having to schlep around with all my stuff on my shoulders! I was just getting tired of the other photo. 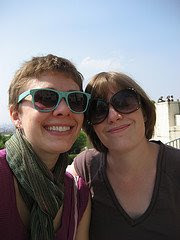 Hope you enjoy this one, from an excursion yesterday to a chateau slash wild animal park. My "aunt" wrote about it in her blog today--check it out for more pics. That I'm in France fantasizing about an American breakfast pastry must be a sign that I am burned out on travel. But here's the truth: there's nothing I'd like more right now than a good, firm cake doughnut. The croissants, pains au chocolat, pains au raisins, chaussons aux pommes, all with delicious buttery pastry, inimitable outside France, leave me indifferent. 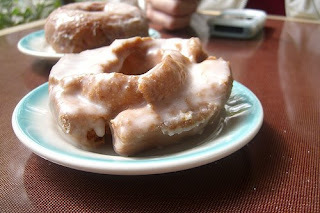 I'm salivating at the thought of this lovely cake doughnut, with a little clear glaze, and a good cup of coffee. Yes, the inevitable (or at least probable) is finally upon me: I am burned out on travel. The schlepping, constant reorientation, and lack of stable q-tip supply has finally worn me down. I'm shopping for plane tickets. On the upside, I've landed in a cozy country retreat--my "uncle" and "aunt's" house outside Paris--while I sort out my return. Funny story about my bicycle...I was planning to ride it around Spain, but the box I picked up from the bike guy in Jerusalem was made to fit a nine-year-old's ride, not so much my big touring bike. I managed to wedge most of it in, but one entire wheel had to be left behind in Kyle's dorm room. The rest of it spent a month in my buddy Pablo's Madrid apartment, until Kyle came to Spain with the orphaned wheel in tow. Poor bicycle. Thus, deciding to leave unicycle touring for another time, I was obliged to travel around Spain like normal folks: on the bus. Since I left you in Granada, I've endured 36 cumulative hours of bus rides to Valencia, Barcelona, back to Madrid to meet my gf, then with her to Sevilla and back. The worst, by far, was my ride with Kyle to Madrid. The entire bus reeked of pork products. A weird dude across the aisle from us stared at our chests for about four of the six hours and then ate a whole package of sausage slices, without separating them, directly off the plastic wrapper. With his mouth. It was enough to turn us off of jamon for the rest of our trip. Speaking of ham, did you know that Spaniards enjoy several varieties of ham-flavored potato chips? There's even a picture of a little ham leg on the bag. French potato chip flavors include mustard, ham-and-cheese sandwich, and herbed rotisserie chicken. Oh, another quick, weird bus story. On my way to Barcelona, I had to ask some chick to move out of my seat. They're assigned, and I like to have a window to lean on when I sleep. She moved over to the aisle and forced me to climb over her to sit. I made myself cozy, then noticed that she was using a crochet hook to dread a long, blond, severed ponytail that was bound with a white scrunchie and held between her knees. Is this the revenge she takes on people who ask her to move on the bus--to chop off their ponytails while they snooze? Thank heaven for my short hair. I'll be posting some photos and such before I make it back home, so stay tuned. I´m sorry I´ve neglected you for so long! My very valid excuse is that I was stranded at a beach resort on the Costa del Sol with my dad and his gf, and we were busy dodging Brits. The only internet at the place was in the office, which was open six hours per day. The computers were coin operated. Picture me feeding euros to a computer while trying to do my taxes and find a place to stay in Málaga, and maybe you´ll be more sympathetic about my lack of blogging. Well, I´m in Granada now. Today I went to the Arab baths, which is a spa lit by candles and star-shaped ceiling lights, with beautiful tiled walls, fountains, and arches. For 23 euros, I got to soak in all the tubs, hit the steam room, lie on warm marble slabs, and get rubbed down with oil by a masseuse. If you come to Granada, GO THERE. There´s something about Spain that makes me want to go shopping. I can´t resist the colorful clothes everywhere, and the huge Zaras in every city don´t help. Consequently, I´ve totally blown my budget and am going to have to scrimp if I´m to keep traveling until July! Fortunately, I´ve had delightful couchsurfing hosts in Málaga (an American who teaches English) and Granada (a Spanish guy who is a day trader), so I haven´t had to lay out too much cash for housing. Hopefully my couchsurfing luck will continue this week in Valencia and Barcelona!